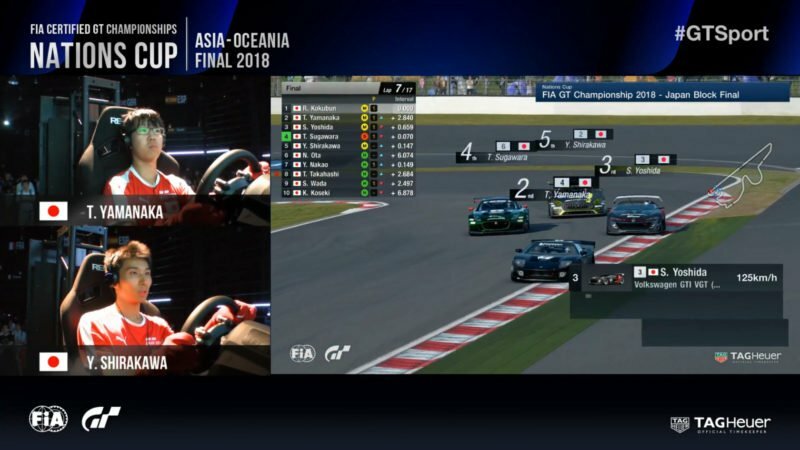 This weekend’s GT Sport Asia-Oceania Nations Cup Regional Final has seen the first ten players book their places at November’s World Final. The slightly complicated format saw the top two drivers in each of three area blocks qualify directly, while the bottom two are eliminated. Drivers finishing from 3rd to 8th would go through to a repechage bracket for one more chance to qualify. For the initial direct qualification race, each group used a themed track, with Gr.3 race cars over a grueling longer distance race with enhanced tire wear. 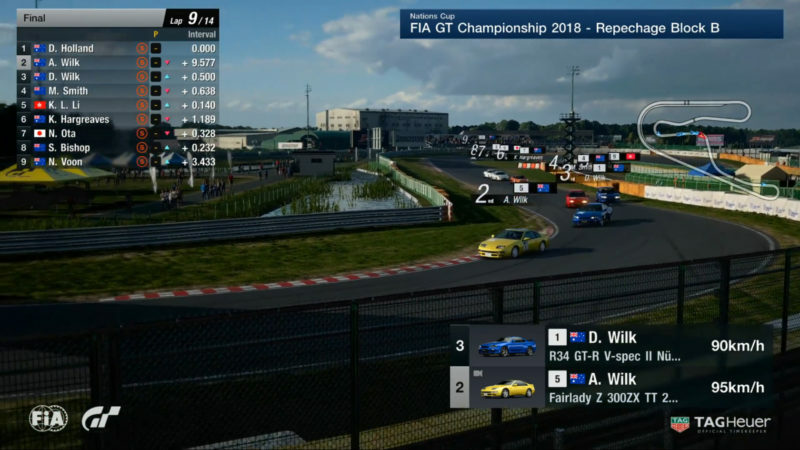 First up were the mixed group from Hong Kong, New Zealand and Taiwan, driving 17 laps of the fictional Yamagiwa circuit, in the reverse configuration. There was almost immediate drama as Chih-Yuan Chang (Di-Hong), the sole representative of Taiwan, got the downhill esses wrong and wiped out the Peugeot RCZ Gr.3. However, the rest of the pack settled down into two groups: the lead six scampering away on medium tires; and the back four on slower, more durable rubber. On lap four New Zealander Hayden Hunter (DoubleH) dropped the Mercedes SLS leaving the slow chicane, falling from fourth to last. He was the first of the medium runners to pit, taking on the hard tires, at the end of the lap. The rest of the cars with medium tires pitted at the end of the fifth lap, with the lead trio of Kai Hin Jonathan Wong (saika159-), Yat Lam Law (NegiFISH_NaF) and Simon Bishop (sidawg2) able to dive into the pits, take on fresh rubber and leave without losing their place on the road. Bishop, surprisingly, took on soft tires, as did compatriot Matthew Smith (MonkeyMan_707). Both became the fastest cars on the track, but both had to pit again on lap 9 as the softs wore. Bishop had got the Toyota FT-1 up onto the back of Wong’s Beetle, but wasn’t able to threaten a pass before hitting the pits. By lap 13, Wong had built sufficient advantage that he could pit for fresh, soft tires and not lose touch with the battling Bishop and Law. Indeed he came out right alongside them, with Yamagiwa’s pit exit on the reverse track right in the braking zone for turn 1. However all three made it through and Bishop soon found himself slipping from trying to pass for the lead to a victim of the Beetle on those brand-new softs. Law followed suit on the next lap, taking on fresh softs and hoping that three laps would be enough to make up the deficit from stopping and with enough grip left to pass Bishop for that important second-place. In the end he just needed two. Running less fuel, Law was able to make the tire advantage count and put the Aston past Bishop’s Toyota approaching the downhill esses on lap 16. At the flag, Wong took the victory by almost eight seconds from Law, with both progressing to the World Final. Chang and Hunter, who’d been needing snookers all race following their crashes, finished in the bottom two and were eliminated. Everyone else progressed to the repechage races. The second race was the Australian group final. 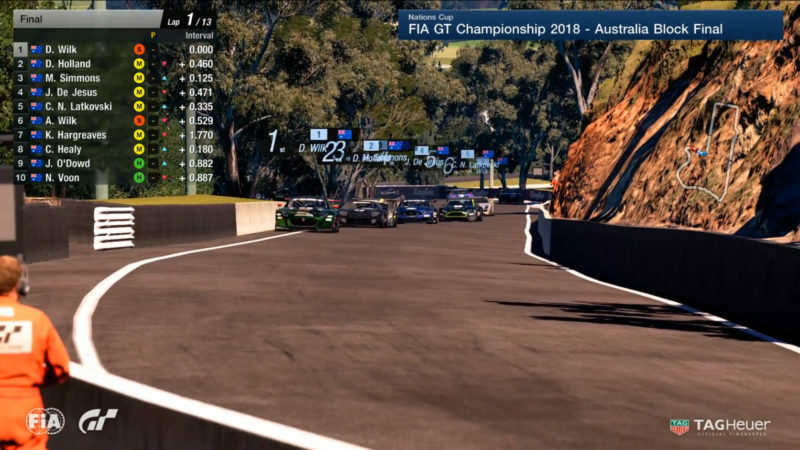 This followed the same format as the first race, only with 12 laps of the Mount Panorama circuit — sometimes better known as Bathurst. 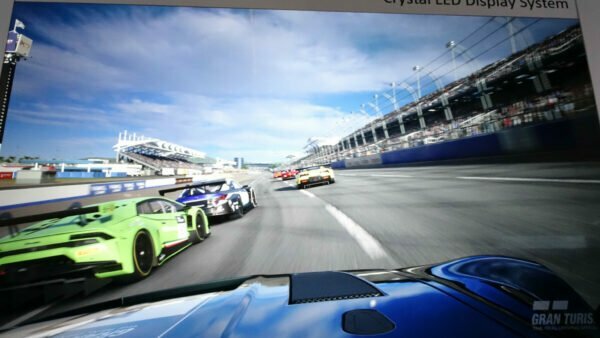 This race began in similar fashion, with the lead four cars — David Wilk (warrior2167) in the Jaguar F-Type, Dan Holland (TRL_holl01) in the Ford GT, Matt Simmons (MINT_GTR) in the Mercedes-AMG GT and Cody Latkovski (Nik_Makozi) in the Aston Martin Vantage — stretching their legs. Like the walls, drama’s never too far away at Bathurst and it only took until lap two. Holland got a little too close to the wall approaching The Cutting and got bounced to the outside. This left enough space for Simmons and Latkovski to get through, and Holland picked up a rather harsh 0.5s penalty — especially given the stewards’ warning to Latkovski for the incident — just to add further insult. After serving this on the Conrod Straight, he’d dropped down to sixth. Latkovski and Simmons traded places on lap 3, while Wilk couldn’t pull away despite the softer tires. As Wilk jumped into the pits at the end of lap 4, so did the rest of the top five. 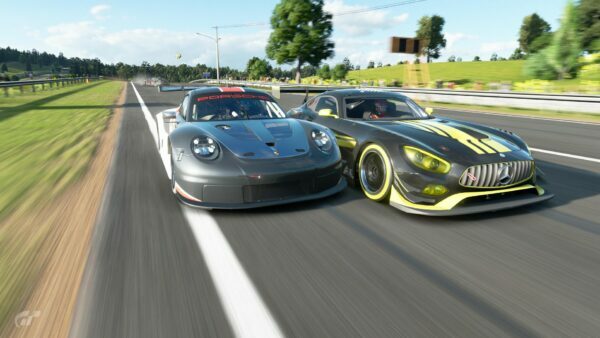 With wildly varied pit strategies, Wilk, Latkovski and Simmons came out into an immediate traffic jam, joined by Connor Healy’s (TheConzio98) Subaru and Adam Wilk (Adam_2167) in the Mercedes SLS — the five cars covered by under a second. 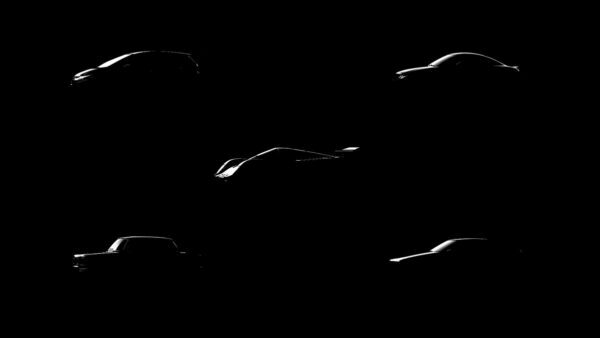 Despite a chaotic few corners, all cars came out roughly the same shape as they went in. However Latkovski took advantage of the mayhem and slipped past Wilk for the race lead, despite his harder tires. The continuing tussle allowed Simmons on the soft tires to close up, but soon he dived into the pits to take on the hard tires to run to the end. 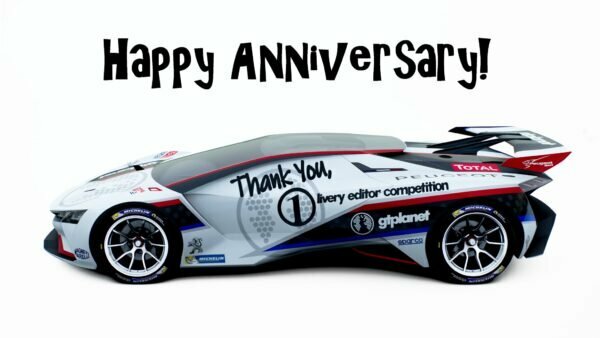 Despite coming out in traffic, the GT Academy winner was able to pass Wilk as he took his own pitstop, gaining effective second on the road. This allowed Latkovski to draw out a ten second lead, pitting with three laps remaining to take on the soft tires. Both Simmons and Wilk passed him, but Latkovski soon made the extra grip pay. He slipped past Wilk before The Cutting and made enough time over the mountain to clear Simmons by the middle of Conrod. Simmons and Wilk kept the battle going right to the finish line, with the Mercedes taking second by just 0.167s, and Latkovski winning by more than seven seconds. That put Latkovski and Simmons through to the World Final, with Healy and Jay O’Dowd (Ott2-gt) eliminated. With four drivers qualified and four going home, it was time for the Japanese round. Keeping with the theme, this time the drivers would have to take their Gr.3 cars around 17 laps of Fuji Speedway F.
The open spaces of Fuji allowed this race to quickly turn into a hierarchy of tires. Leading the way after three laps were the three cars on soft tires: Ryota Kokubun (Akagi_1942mi) in the Aston Martin, Tomoaki Yamanaka (yamado_racing38) in the Ford GT and Shogo Yoshida (gilles_honda_v12) in the Volkswagen VGT. As the soft-runners continued to draw a second a lap’s advantage, the first cars to pit were two of the cars on mediums. Tatsuya Sugawara (blackbeauty-79) and Syunsuke Wada (rest0g) came in on lap four, and split their strategies. Sugawara took a set of softs, while Wada went for the much slower hards. The leading trio all came in on the next lap, all opting to switch to the medium tires. That put Yuki Shirakawa (yukiku) — who’d had a terrible start from second in the Mercedes-AMG GT — into the race lead as he was yet to pit. Soon it was new rubber versus old, as Kokubun closed Shirakawa. However, the Mercedes didn’t pit as expected and the two nearly came to blows at the Daiichi hairpin. Kokubun made the pass stick though and set about stretching the Aston’s legs. Shirakawa became something of a rolling roadblock in the final section, with Yamanaka, Yoshida, and Sugawara all over him. In a spectacular three-wide maneuver, Yoshida and Sugawara passed either side of the Mercedes in Panasonic corner. Unusually Sugawara pitted for a second set of softs — drivers have to use all three compounds and most only took the minimum two stops to do so. Kokubun and Yamanaka then pitted on lap ten, onto their last set of hard tires. This looked like a poor call from Yamanaka, as he came out behind the scrapping Yusuke Nakao (CLS63AMG-sc) and Sugawara, but he made the undercut count. When Yoshida pitted a lap later, he came out well down on the Ford, and alongside Nakao’s Corvette, for a heart-stopping first turn moment. With all the stops done, the cars were pretty evenly spaced along the track — aside from Sugawara and Shirakawa, who kept their tangle going through to the finish line. 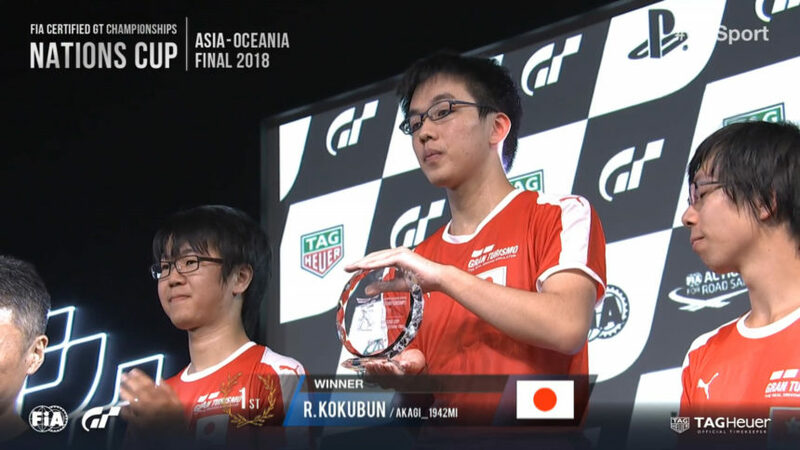 Kokubun was able to relatively coast to a win, taking the flag by just under five seconds from Yamanaka, with both qualifying for the World Final. 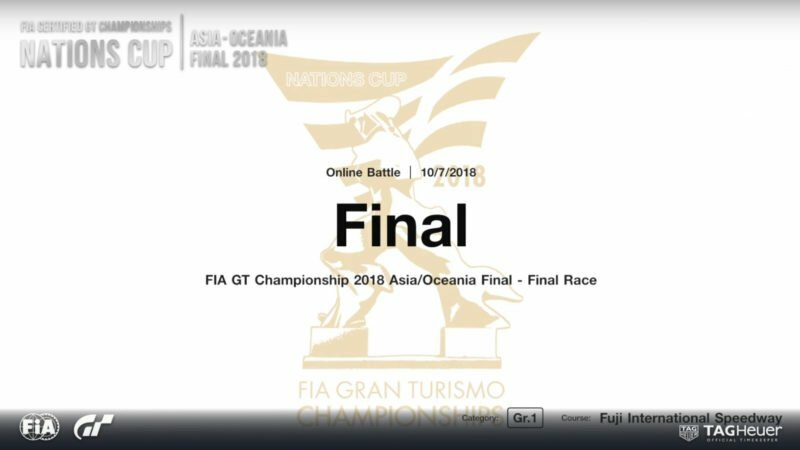 Eliminated were Wada and Kazuya Koseki (haru_lilil), who’d had a fairly torrid race in the Lexus RC F.
For the two repechage races, things became a little simpler. 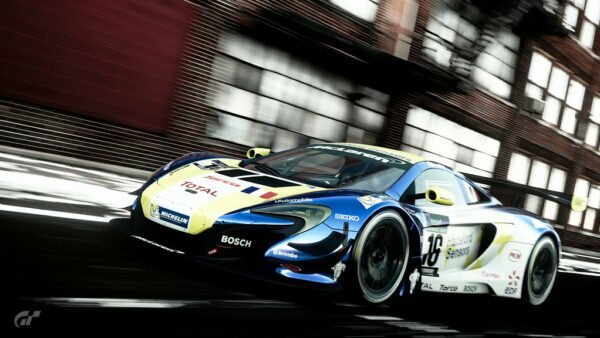 Both races would take place on the Tsukuba Circuit, in N300 (~300hp) road cars on comfort soft tires, and be a simple, 14-lap sprint from lights to flag. 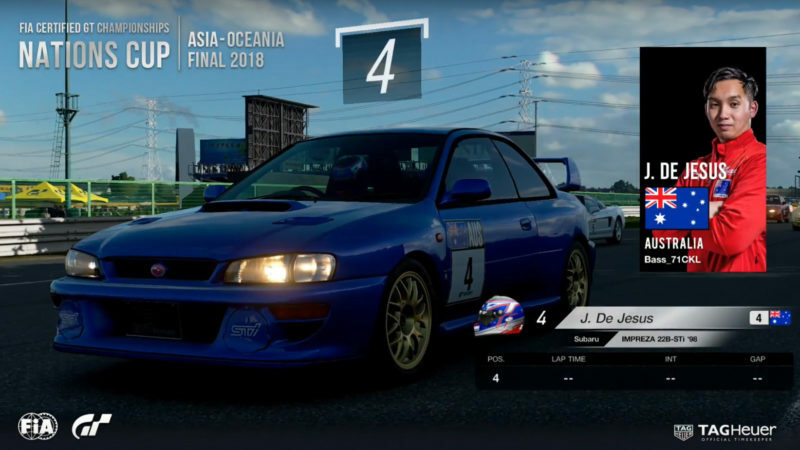 Polyphony Digital did throw one surprise our way, by revealing the Subaru Impreza 22B. 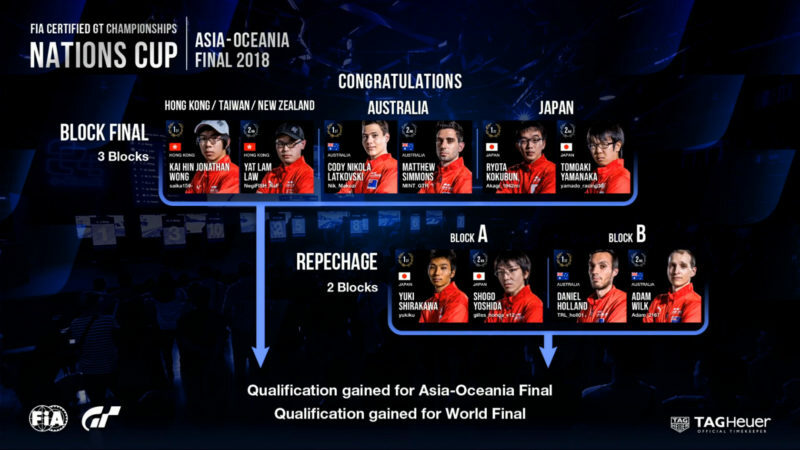 The draw saw the first race have five Japanese drivers face one from the Australian group and three from the Oceania final. The regional rankings determined the grid positions and order of car choice for the drivers, so Shirakawa started on pole in the Nissan Skyline R32 GT-R, ahead of Yoshida in the R34 version. As the two Nissans started to pull away, the first drama came at the tail end of the field on lap two. The two Wongs came together, resulting in Wang Chuen Wong (Winson12Wong09) ending up facing the wrong way into turn two in his Toyota MR2. The stewards pinged Chak Ming Wong (WING-OF-BUG86) with a five second penalty — the first in any of the races at these finals — for his part in the incident. Meanwhile Joseph De Jesus IV (Bass_71CKL) was tumbling down the order in the 22B after some very wide-hipped driving from first Nakao in the Mazda RX-7 FD and then Sugawara in the Honda NSX Type R. The stewards warned Sugawara for his conduct after a nosed pass in the second turn moved him up to fourth, although this didn’t stop the two Japanese drivers trading door handles. However, on a notoriously difficult track to overtake, the positions didn’t change from that point onwards. Shirakawa and Yoshida kept threatening to swap places, but in the end Shirakawa took the win by just 0.115s from his countryman, leading the other two Japanese drivers home by just over two seconds. The second repechage mirrored the first. 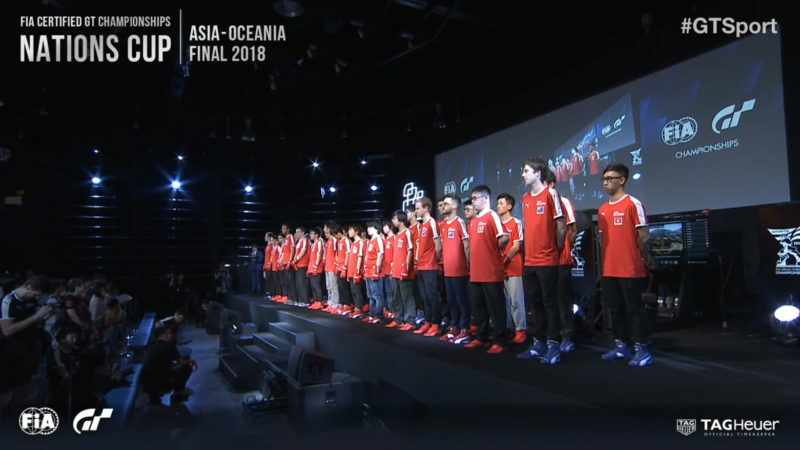 This time it was five Australians, one Japanese driver and three from the Oceania group. As before, the lead two drivers — this time Holland and David Wilk — chose the two GT-Rs. The first incident occurred almost immediately though, as Bishop lost the tail of the RX-7 exiting turn one and ended up on the infield. He dropped straight back to ninth, which effectively put the driver who finished third in his group out of contention before the race had even started. By the end of the lap, the lead had changed. Holland, himself a former GT Academy finalist from 2010, slid the R32 up past David Wilk in the R34 on the back straight. 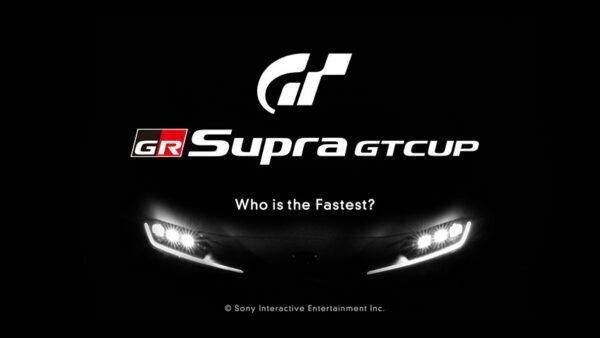 He’d never relinquish it throughout the rest of the race — clearly the classic Gran Turismo track and car suiting the experienced Gran Turismo player. That left second place to fight for, and the two Wilks — both in Nissans — were vying for that, along with Smith’s Evo 4. As Smith and Adam Wilk traded paint on lap three, Natsuki Ota (n76w83) was able to join the fray in his Supra RZ, making it a four-way tussle. Before long it became a six-car train, as the 22B of Kin Long Li (KarS_0627) and Kyren Hargreaves (Kyzzaa222) in the Toyota MR2 joined in, all covered by just 1.5 seconds. Adam Wilk got his skates on at that point. From being in danger of dropping to sixth in turn two, he pedaled the Fairlady Z up to third entering the final turn, and came close to sending it up the inside of his brother David Wilk into the first turn. He finally made his move into the second turn on lap nine. As David Wilk defended the line, the GT-R snatched the front brakes and understeered wide, allowing the rear-wheel drive to cut under and take the place. The two kept at it for most of the closing stages, and could have had a Wilk 1-2 near the end. It looked like Holland’s R32 was suffering with the tire wear, having raced to a ten second lead, and he made a mess of both turns one and two on his final lap. His experience showed through though as he kept it together to cross the line five seconds ahead of Adam Wilk by a whisker from David Wilk. With the business of qualification done, matters on Sunday turned to crowning a regional champion. 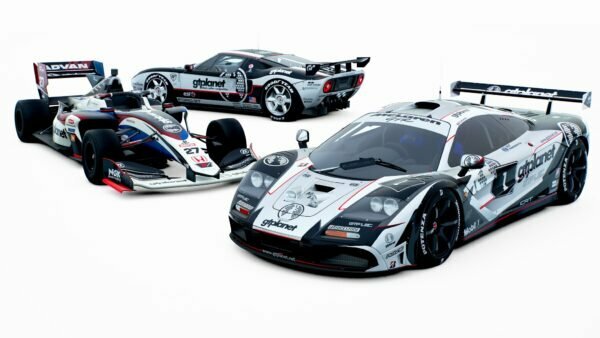 For this the drivers faced off in three races, using N500 (~500hp) road cars at Suzuka, then the Gr.3 cars again, at the fictional Dragon Trail Gardens circuit, and finally a Gr.1 race at Fuji Speedway. The drivers got to select their vehicles for each race according to their regional ranking, giving Kokubun a theoretical advantage. This certainly proved to be the case in the initial qualifying session, with Kokubun putting the Porsche 911 997 GT3 on pole by just over a tenth from Wong, who had second pick. After a well-behaved couple of laps, the top five — the four Japanese and Wong — had left the rest behind. Although only a couple of seconds apart themselves, they’d pulled nearly five seconds on the Australians and Law. Indeed by the time the first front runner chose to pit — Yoshida in the NSX — he was able to get out still ahead of the second tier cars that hadn’t. Latkovski’s pit exit error, with the Viper crossing the line onto the active track, gave him a five second penalty from the stewards. Holland and Law joined him on the same naughty step, and though this seemed innocuous at the time, it would come into play later. The top four came in for fresh sport hard tires on lap five, and normal service resumed. In the end, Kokubun was never really troubled and managed the Grand Chelem of leading every lap from pole position and winning with the fastest lap of the race. Following home were Wong, Yamanaka, Yoshida and Shirakawa, representing only one change of position from the grid. From there the action moved to Croatia. This race was similar to the first round on Saturday, with Gr.3 cars and mandatory use of all three tire compounds. Again, the drivers chose their cars according to their regional ranking, and Kokubun selected the Beetle that had served him so well on the Saturday. The cars lined up in the order they had finished race one. At first it seemed as if the racing would go to the form book, but Kokubun made an uncharacteristic error in the quad-apex corner and picked up a half-second penalty. This dropped him behind Yamanaka in the Mercedes-AMG GT before the end of the lap, although the big Merc was on softer tires from the start. Lap two was where the real controversy happened, with all of the Australians caught up in one unfortunate moment. Holland tried to pass Simmons into the hairpin, but was too late on the brakes. Although Holland only put himself off the road and into the run off, the cars behind all reacted. Wilk moved to the inside into the gap Holland had left, with Latkovski moving even further to the inside. With no room left for braking Latkovski clattered into the side of Wilk’s Lancer, which in turn took out Simmons. The stewards found Latkovski at fault for the incident, slapping him with a five second penalty. The first round of pit-stops soon followed and so did more penalties. On his first flying lap out of the pits, Holland dropped the Aston onto the outside kerb leaving the first double-apex corner and nosed into the barriers. As he recovered, the stewards piled on the misery with a 10 second penalty for the repeat offense of crossing the pit exit lines. At the front it was a tale of three pit strategies. Yamanaka had track position, but was running his final stint on the hard tires. Kokubun’s plan was similar, but he’d run the medium and then soft tires right through to lap 10, leaving the slower hard tire on for as little time as possible. Meanwhile Wong in the Subaru was on the fastest soft tire — and all three were covered by under two seconds. Wong made his move at the start of the penultimate lap, getting a run out of the final turn and sending it alongside the Mercedes. Yamanaka squeezed the Subaru up against the pit wall, but Wong made it stick and kept it together for braking. Although Wong was away, the battle brought Kokubun back into play for second place. In a fight that lasted all the way to the line, Yamanaka just took the second step, by just 0.047s. As with race one, the Japanese drivers filled the rest of the top five, with Adam Wilk the top Australia in sixth. That gave Wong, in the Porsche 919, pole position for the final, double-points race at Fuji. With the raised stakes came instant drama. Holland, in the Peugeot L750R, spotted an opening in to turn one, and slung the Vision GT car up from 10th to 5th in the space of one braking zone. In the process, Shirakawa span off the inside of the turn in his Audi R18. Although not shown on screen, the stewards decided something had been amiss and gave the Australian a three-second penalty for “illegal blocking”. Even before that lap finished, he was on the receiving end of another three-second penalty for contacting the Alpine of countryman Adam Wilk. Meanwhile both Law and Yamanaka had similar automatic penalties for track limits. This had all let the front two and points leaders Kokubun and Wong waltz away from the rest. That made it a straight fight for the title, and Wong laid his marker down by passing Kokubun’s Toyota TS050 for the lead into the first turn on lap five. Unusually, the cars came into the pits together at the end of the lap, despite a tire compound difference, with Wong swapping soft for medium and Kokubun dropping mediums for hard. The two, now three seconds ahead of Yamanaka in third, swapped places again on lap eight. 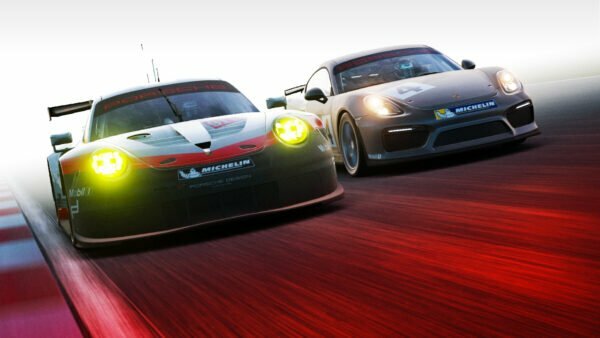 Kokubun’s later corner entry into the final turn gave him the run on the Porsche, and he took first place back before turn one. As both pitted again for their final set of tires, Latkovski — having a much better race in the Hyundai N2025 — assumed the lead. However, he was soon swamped by both Wong and Kokubun, resulting in a three-wide run through turn six. 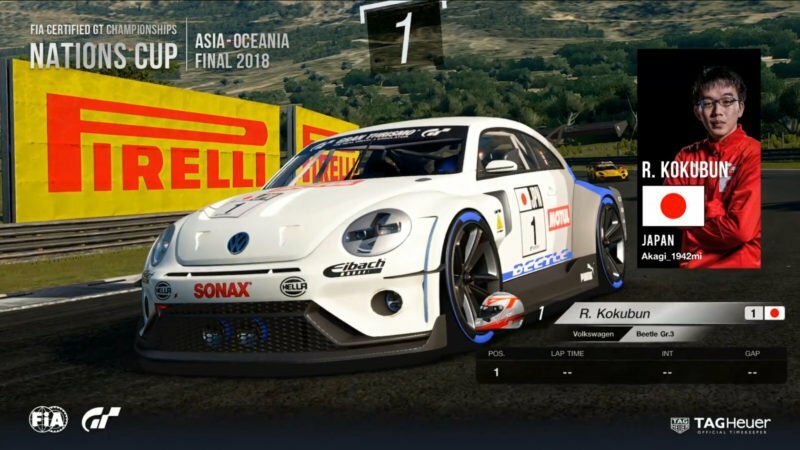 Kokubun had the initial track position, but by running out wide around Latkovski’s right, he opened up the inside line and Wong took it with glee, jumping back into the race lead and overall championship. However Kokubun, on soft tires now, had the traction out of Dunlop Corner and blew past Wong with ease. Wong soon slipped further back as Yamanaka took him by surprise into turn one. He cut a frustrated figure behind the Mazda, as despite the 919’s better cornering speeds, Fuji’s main straight played to the Mazda’s strengths — each time Wong was within touched distance, the LM55 just kicked off into the distance. This all allowed Kokubun, trying to make the soft tires last an age, to build a four second advantage for himself. Despite the old tires, Kokubun got to the finish first, five seconds clear of countryman Yamanaka, with Wong third. That gave Kokubun two wins from three and the title of Asia-Oceania Nations Cup champion.